With the start of the 2018-2019 school year fast approaching, we at the Society thought it a good time to review the history of the Braintree Public School System. We hope to introduce our newer members to those responsible for the great school system we enjoy today, as well as offer a refresher for our long time valued members. It wouldn’t be possible to write about the Braintree Public Schools without mentioning Thomas A. Watson. Though his greatest acknowledgement in life was working alongside Alexander Graham Bell and hearing the words “Mr. Watson—come here—I want you” his success and leadership continued for years to come. While the invention of the telephone put him on the world stage it was his move to East Braintree and his willingness to take an active part in the education of his four children that set the foundation for the success of the Braintree Public Schools. During his time on the School Committee Mr. Thomas Watson was involved in the building of three schools. One of them, the Penniman School, (since torn down) was named after the mother on Norton Eugene Hollis. It was probably then that the paths of these two great Braintree Public School benefactors first crossed resulting in the schoolchildren of Braintree benefitting for years to come. There will be more to come on Mr. Hollis in the October issue of the Lantern Online.The following is Part 1 of “Thomas Watson’s Contributions to Education in Braintree”. 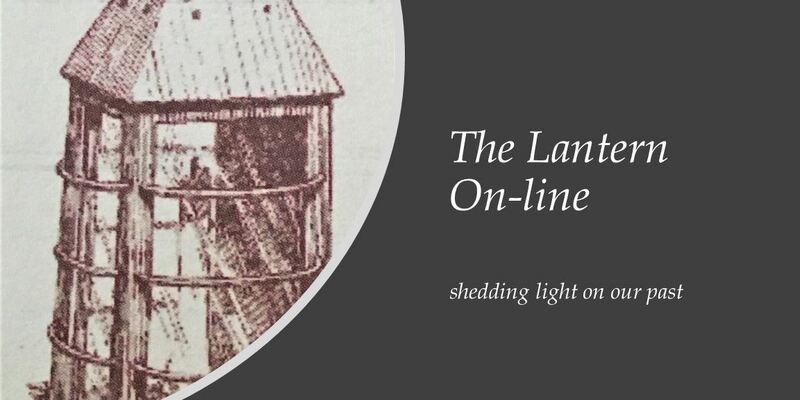 This was written by Jennifer Potts our Curator at the time and was first published in the printed Lantern in the September 2006 issue. A. Watson (1854-1934) is undoubtedly one of Braintree’s most notable citizens, and his decision to settle here in 1883 resulted in many important contributions to the town. Not only did Watson’s Fore River Ship and Engine Company put Braintree on the map as an important local shipbuilding center, he was also a driving force behind the improvement of Braintree’s schools. So, as Braintree’s children head back to school after the summer, it seems fitting to devote some space to the many ways in which Watson’s special commitment to education helped to improve the schooling experience for everyone. Watson was responsible for founding Braintree’s first kindergarten and, as a School Committee member, helped raise the bar for educational standards. He was also instrumental in the planning and building of three new schools for the town. Between my sixth and thirteenth year I attended four different schools. The details of my work in them are very hazy in my mind probably because the work was so uninteresting. I remember chiefly the frequent thrashings the boys got from some of the teachers who seemed to delight in punishing for the least offense. I learned little in these schools. When I was eleven years old I could read well to myself but had never been taught to read aloud with expression. I wrote in a poor, cramped hand. I had memorized pages of grammar but had no composition work. I could do simple problems in arithmetic slowly and inaccurately but no teacher made any application of my number work to practical matters. I memorized dull pages from a history book but no one ever suggested that I study Salem’s rich history or visit its interesting museums. I knew islands and capes on the map but never had any attention called to examples of them on our own shores. There was no nature study nor manual training in the schools of my boyhood. Although Watson himself left school at the age of fourteen to get a job (fairly typical for the time), he had an inquiring, intelligent mind and a life-long personal love of learning that would later inspire him to turn what he viewed as the shortcomings of his own education into a positive force for change when his own children came of age. 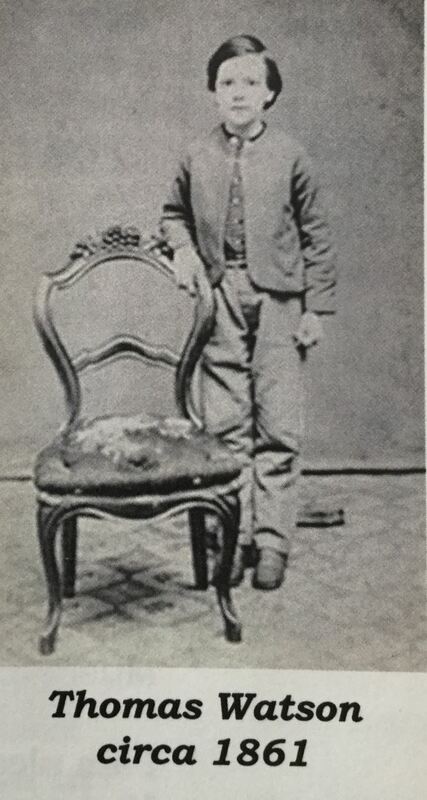 Watson was a firm believer in the importance of early childhood education and it was this belief that would lead to the establishment of Braintree’s first kindergarten. 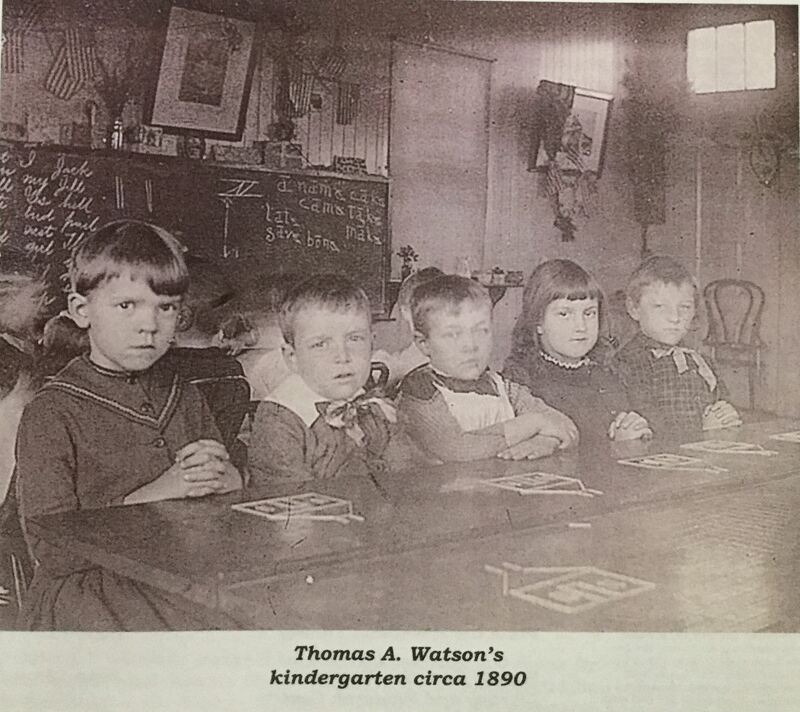 Watson and his wife, Elizabeth, first became interested in setting up a kindergarten for their own children in 1889, and the idea proved so successful that it led to the establishment of public kindergartens in Braintree. 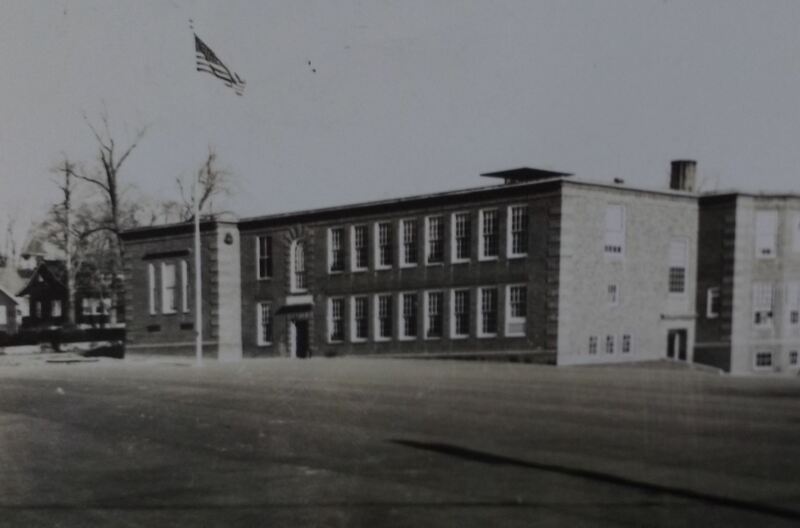 The Watsons set up their private kindergarten on their East Braintree property in the building where Watson had first begun working on the manufacture of steam engines several years earlier. They hired a teacher, invited neighborhood parents to send their children and opened the school with about a dozen pupils. The Watson’s kindergarten soon attracted the attention of the town and on January 28, 1891, Watson was appointed Chairman of a committee to study the need for new school buildings in Braintree. This committee proposed a plan to alleviate overcrowding in the Union and hools in the north and south sections of the town by building “one carefully designed school building, containing at least eight large rooms, and to be located about half way between the Pond and Union Schools.” This building, which later became the Monatiquot School would provide classrooms for pupils in the fifth, sixth, seventh and eighth grades, and would also be used as a High School. This plan was approved by the town, and the sum of $33,000 was appropriated to construct the recommended building. 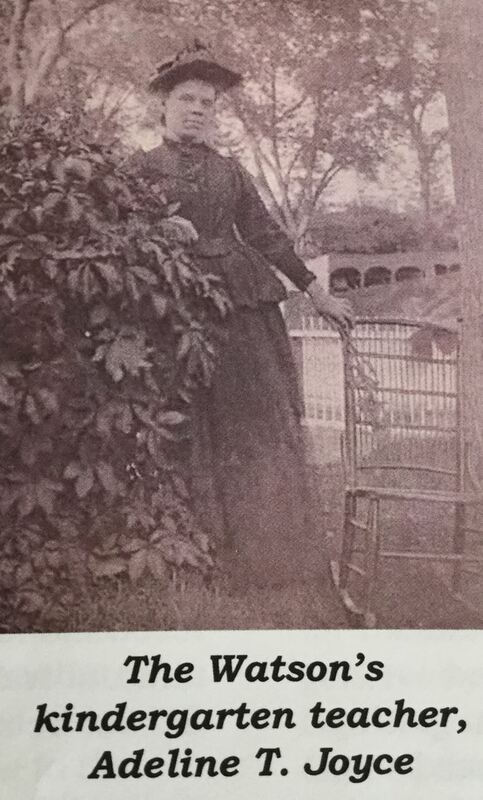 The success of the Watson’s kindergarten also sparked an interest in establishing public kindergartens in Braintree. The report of the Superintendent of schools on January 31, 1893 acknowledged the important role kindergartens could play in the early education of children; and on February 15, 1893, the School Committee recommended establishing three new public kindergartens, one in each section of the town. The town made provision to equip and support the three proposed kindergartens on March 13, 1893; and in the second week of April, two of the new kindergartens opened, one in the former High School apartments of the Town House and the other in North Braintree in Lyceum Hall. East Braintree public kindergarten opened in the upper room of the East Schoolhouse in September 1893. Mrs. Watson kept her private kindergarten open to the public until the end of the school year and then donated all of her school’s equipment to the new one. Braintree’s new kindergartens were well attended and very successful, and their example was soon followed by other Massachusetts towns. On March 28,, 1892, Thomas Watson was appointed to the town of Braintree School Committee and remained an active member until 1911, serving as Chairman from 1892-1899. Watson believed that introducing children to a broad range of subjects would help stimulate a desire for life-long learning in adult life, as he recalled in chapter three of his autobiography: “My experience convinces me that it is better to give a child as many glimpses into the vast treasures of knowledge as possible for he is much more likely to go further in a subject to which he was early introduced even if that acquaintance was but slight.” As part of the School Committee, Watson applied this theory in Braintree’s schools and worked hard to broaden and improve the range of subjects available for study to include English language work in reading, writing, and composition, nature study, geology, music, drawing, gymnastics, geography, manual training, penmanship, elocution, singing, and history. Watson’s desire to raise educational standards for Braintree’s children had a strong influence on his fellow School Committee members; and he was probably also the impetus behind attempts to raise standards at Braintree High School and the establishment of an even school later in 1911. 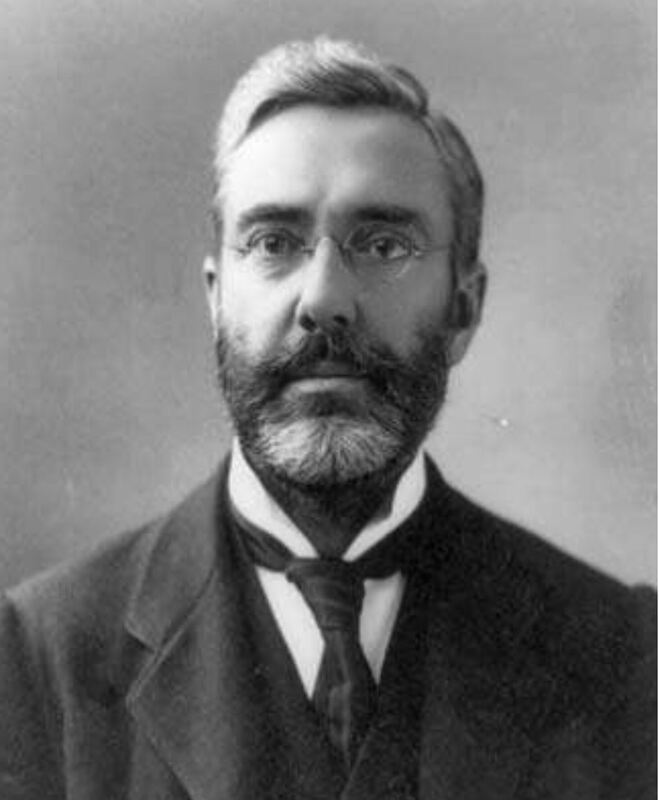 "I thank the Fates that led me to Williams’ (the Boston machine shop of Charles Williams, where Watson first met Alexander Graham Bell in 1874 and began work on the telephone) not only for the material success that came to me, but even more for the thorough training of hands and brain my work there gave. My advice to all parents is to have their boys and girls taught to use their hands skillfully in some worthwhile mechanical trade regardless of what they expect to do for a life work. My observation of friends and acquaintances, who have never had any manual education, is that they are handicapped seriously in some way or other, even though they seem utterly oblivious to themselves." Watson’s firm belief in the importance of manual training can also be felt in the Superintendent’s 1892 assertion that a good education should educate “the head, the heart, and the hand.” This sentiment is also repeated in the Superintendent's report of 1893: “I wish to call attention to the growing faith in the public mind in the importance of manual training as a necessary element in education. The traditional school has done much to educate the head, very little to develop the heart and nothing to train the hand. The most perfect man possesses this threefold development, and that alone which gives this, can be called a real education.” Watson seems to have successfully imparted this feeling to the rest of the School Committee because they recommended that the establishment of a manual training class at the Monatiquot School be made a priority in 1892. 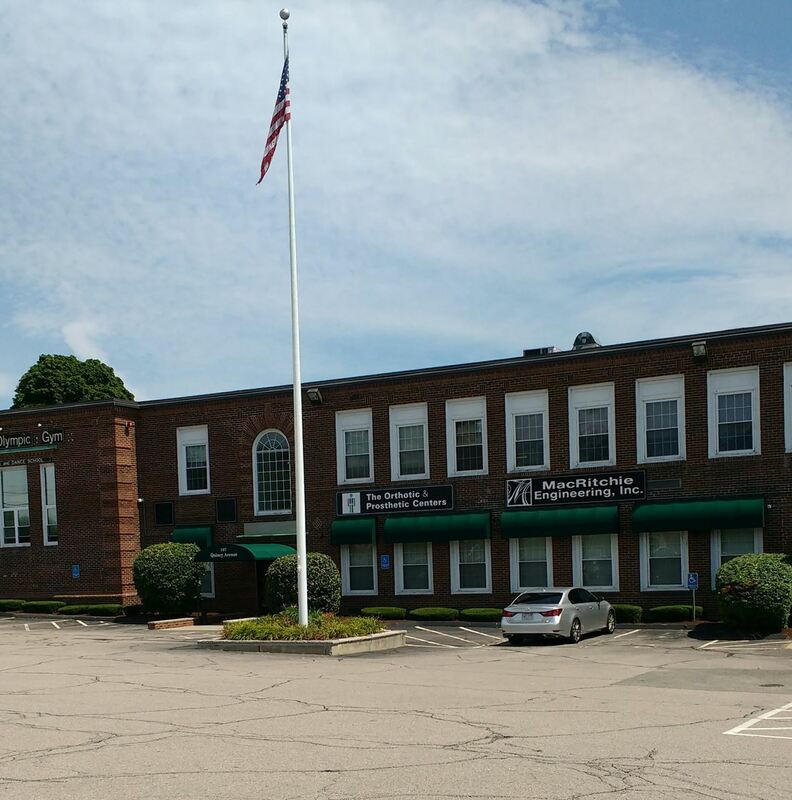 The Watsons had had a manual training program in place in their East Braintree kindergarten since 1890, and this seems to have given East Braintree a head start in implementing manual training programs in their other schools. By 1897, East Braintree schools, especially the Jonas Perkins School, greatly benefited from Watson’s generosity and made considerable advances in implementing manual training programs. At his own expense Watson fitted out the Jonas Perkins School with the Sloyd woodworking system; and both his and the school’s efforts are commended in the Superintendent’s report of 1897 which declared that: “Those young people at the east part of the town who – through the generosity of Mr. Watson, work hard at Sloyd, cut and sew, and cook – are doing something – are to be congratulated. They are educating that other half of the child that has been neglected in our schools hitherto. It is a great pity that all of our pupils are not given these most educative forms of instruction.” Watson’s views on manual training later came to be shared by those in the State legislature as they discussed how schools could best prepare pupils for the working world. In 1898, a law was enacted that authorized school committees to provide instruction in practical subjects, such as manual training, cooking and sewing. Everyone knows about Library Cats. 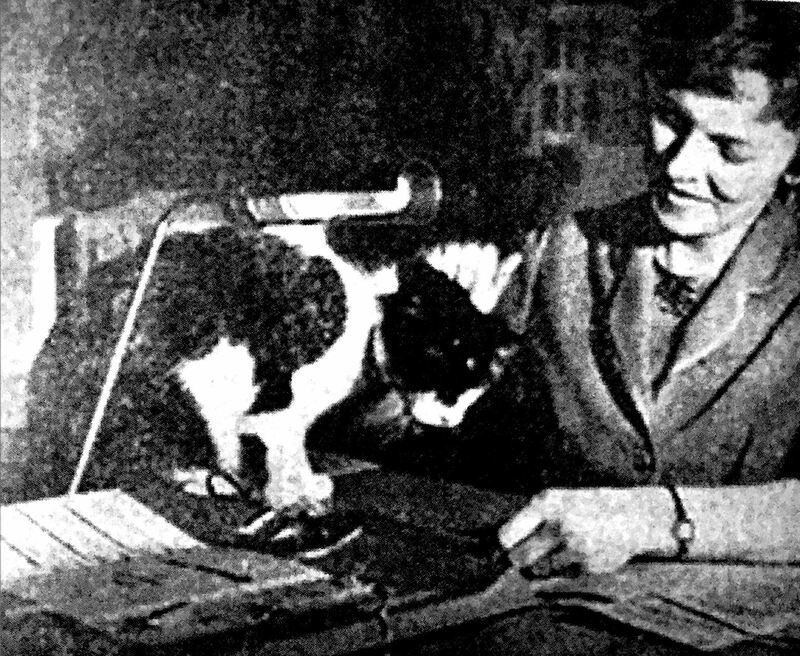 At least 125 libraries across America are known to have cats “working” in them; and there is even a Library Cat Society and a video call Puss in Books. But did you know that Braintree once had a Town Hall Cat named Lopez? In our files we found a clipping from Boston Herald – no date, just a story called “The Lopez Item” telling of an upcoming Braintree Town Meeting where an article on the warrant called for an annual food allowance of $50 for Lopez, the Town Hall Cat. The author was very much in favor of the article and suggested that $50 was not enough. Maybe the cat had other expenses. What about veterinary bills, since the cat probably didn’t have Blue Cross, and how about a retirement plan? A little research led to the rest of the story. It seems that Lopez was a rather old cat that had been provided with food by the Town Hall custodian, Gerard (Jerry ) McMorris. A group of some 41 people, town employees and friends, got together and petitioned to have an item put in the warrant. The Town Report tells the rest. Moved by Mr. Libby: That the Town vote to raise and appropriate the sum of $50 for the purpose of the care and feeding of Lopez, the Town Hall cat. Mr. Juster read a letter from a manufacturer of pet food offering to donate a supply of cat food for the balance of the year. SO VOTED: The sense of the members that the gift be accepted on behalf of Lopez. Mr. Proctor spoke on the motion by Mr. Libby. Comes now the question on the motion of Mr. Libby. Vote was taken and the Moderator declared the motion by Mr. Libby LOST. So Lopez got his food allowance, but no thanks to the citizens of Braintree. This article was previously published in the printed Lantern March 2006.